What is it? 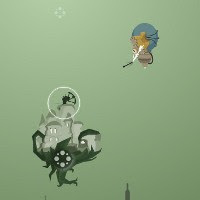 – The Arrow of Time is a base-defense shooting game in which you must help Peep, last of the WhistleKnights, defend Sky Kingdom and protect a legendary arrow of unspeakable power. Who made it? – The game was developed by The Super Flash Bros (Monkeymetric). How does it play? – The Arrow of Time shares some gameplay similarities with titles like Bowmaster Prelude and Stormwinds. You’ll fire arrows at a variety of flying enemies as they assault Sky Kingdom across several different “historical” time periods. Enemies will attack you from all directions, and different units have their own movement patterns, speeds, and weaknesses. You can spend points you’ve earned to upgrade the Sky Fortress with extra defenses or purchase new arrow types. The arrow-types range from standard environmental fare (fire, ice, lightning, etc. ), to more esoteric offerings like teleport, traitor, and gravity arrows. Once you have acquired multiple arrow types, you can combine them in battle for various effects. Presentation – The units and environments are given a proper sense of depth thanks to some creatively minimal shading, and many units (especially in the early eras) have a Steampunk feel. Atypical of similar games, the levels are also tied together by a light story and cinematics. They’re not exactly stupendous, but they’re well done and provide some narrative motivation. Positives – The bow-and-arrow shooting mechanic is very well done. There’s also a lot of variety to the enemies and weapon types, and a healthy number of levels across multiple time periods. The whole package feels very polished. Negatives – Firing your bow and arrows may take some getting used to, and may scare away those averse to small learning curves. There are 12 different types of arrows (that can each be upgraded), but some don’t seem very useful. Picking and upgrading a few favorites is a winning strategy. Why you should play it – The Arrow of Time is a fun experience with creative visuals and a creative characters and settings. The gameplay isn’t very deep, but it’s well-executed and fun, while it lasts.